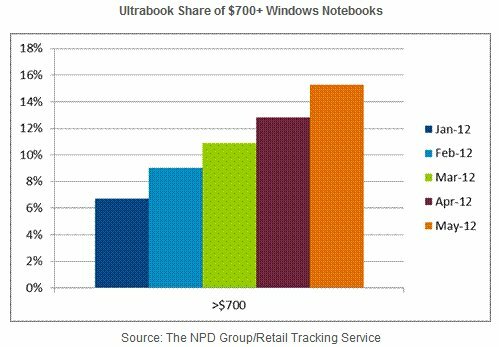 Ultrabook sales are off to a fast start capturing nearly 11 percent of all $700+ Windows notebooks sales at U.S. retail through the first five months of 2012 according to leading market research company The NPD Group’s Retail Tracking Service. While the overall Windows market for notebook PC sales fell by 17 percent, Ultrabooks helped propel the premium market with Windows notebooks priced over $700 falling by just 3 percent, and those priced over $900 increasing 39 percent versus the prior year. This strong performance comes as Utrabook ASPs remain considerably more expensive than the market, with selling prices that averaged $927 over the first five months of 2012 and only dipping below $900, to $885, for the first time in May. While this is considerably above the Windows market price of $510 average pricing has risen by $13 since the same period in 2011, in part due to the growth in Ultrabook sales.